Selecting the right bagging equipment for your needs can be a daunting task when you consider the range of manufacturers in the market. There are many things to consider. We have narrowed it down to six of the most important questions that you must answer when selecting open mouth bagging equipment. What production rate and bagging accuracy do you need? Your desired bagging rate is a crucial thing to know. Is it 2 bags a minute or 24? Planning your purchase not only based on what your bagging rate is today, but being able to scale up with growth is also important. The ability to keep up with your future customer demand will help you determine the best equipment for you. Also, it is good to remember that speed and accuracy are often interdependent with each other. If you need a production rate that is higher speed you may sacrifice some accuracy to reach a certain price point. On the contrary, if you need extreme accuracy the speed at which you can maintain high accuracy will often decrease. What type of bag are you using? Paper bags, lined paper bags, plastic type bags, poly-woven bags: The material of construction of the bag, how it is placed on a bagger, how it is closed and handled further down the packaging process all needs to be considered. Some bags lend themselves to automation while others do not as easily. Equipment needed to close the bags differs both in design and price. The type of bag and how it is made will greatly affect what bagger and auxiliary equipment you need. The product’s flow characteristics (or lack there-of) help to determine the bagging device needed to consistently fill your desired package. Different types of fill mechanisms are required for different product types. Pellets are different from powders which are different from fibers which are different yet again from irregular chunks. During filling, does the product create a lot of dust? Does it need to be de-aerated? There are a variety of bag fillers on the market and they will vary greatly in features available. You will want to work with a supplier that has a history of providing integral features to your bagging equipment to get the desired results for packaging your product. How much do you want to automate? Automation is a word that can have a variety of meanings depending on the complexity of your current process. 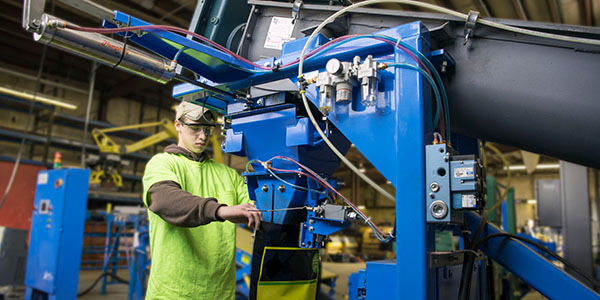 Really it comes down to: “What level of automation makes sense for your operation?” If your current process is filling bags by shovel or scoop, using a hand sewing unit, and then walking a bag to a pallet or box for preparation of shipment then automating your line might be as simple as adding a bag filler with an electronic scale. 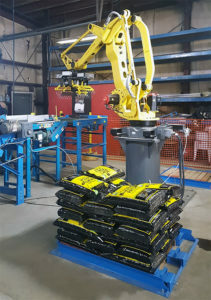 If you already have a bagging line in process, but still palletizing manually then adding a robotic palletizer might be the stage of automation you need. If you are building a new facility foot print is important but most likely you have more room to work with and plan for. If you are installing new equipment into an existing process the foot print of the equipment you select is a huge determining factor. You also have to consider any height restrictions. Ceiling heights and current hopper discharge heights will sometimes dictate the type of equipment you can fit into your process without adding additional intermediate conveying systems. Finally, you have to consider is how much money are you able to invest into your bagging equipment. If you are a smaller operation then it may be more economically practical to start with a manual bagging scale process. As you grow, you can start considering more automated packaging equipment options, which typically yield decrease labor costs. Remember, however, that the more automated the equipment, the more training and support you will need to account for. Selecting a supplier that stands behind their equipment and is available long after the sale is key. Additionally, when planning for automation you want to keep in mind growth. At what point will you have to upgrade equipment again? Don’t just plan for the next step; keep in mind additional steps of growth and what packaging line equipment might need to grow with you in that process or what the ROI will be. After you answer these questions you will be able to narrow down the choices of suppliers that can provide what you need. It may be cliché but every application truly is different and there is an optimal bagging machine for your unique material and process. Let Magnum Systems be that valuable partner. Depending on your material type, application environment, business objectives and financial goals, Magnum Systems will design a packaging equipment solution that best fits your needs.